Moscow has said it is ready for dialogue with new Ukrainian leader Petro Poroshenko, who exit polls suggest has won an absolute majority in the recently concluded election. Russian Foreign Minister Sergey Lavrov on Monday said his country would respect the will of Ukrainians in the presidential election, but warned Russia “definitely does not need” mediators in talks with Kiev. “The fact that the vote was organized in many regions of Ukraine could probably be regarded as a generally positive fact. As the president (Vladimir Putin) has said, we will respect the will expressed by the Ukrainian people,” Lavrov told reporters on Monday. Exit polls show the “Chocolate King” Poroshenko won Sunday’s presidential election with an absolute majority. “The only thing, I would very much like his declared readiness for a dialogue not to be conditional on internal reservations, as he mentioned, in particular, that he will be ready for a dialogue with us with the mediation of the European Union and the United States,” Lavrov said. “We are hoping that Petro Poroshenko will do everything to prevent some extremist radial tendencies in Kiev toward the eastern and southern regions of Ukraine, or on any other region of this country, from prevailing,” he said. 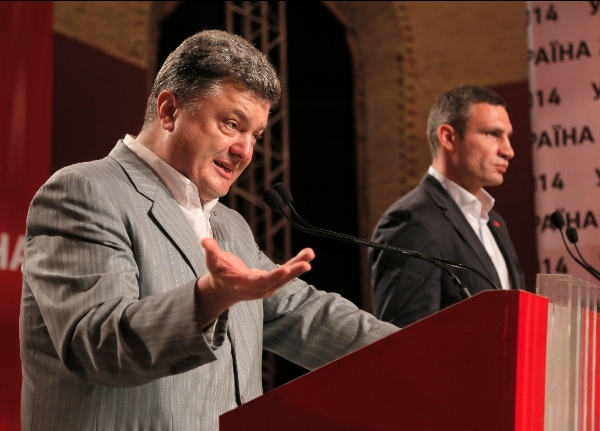 Meanwhile, Poroshenko has said he would like to “end the chaos” in the country. “My first decisive step will be aimed at ending the war, ending chaos, and bringing peace to a united and free Ukraine,” Poroshenko said at a press conference in Kiev.